Encouraging Girls to be Pretty Curious about their future with EDFEnergy. 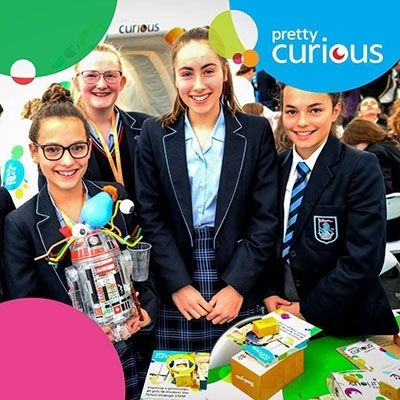 Pretty Curious, entering its third year, focuses on raising awareness of the under-representation of girls in STEM roles, as well as providing them with relatable role models. Pretty Curious hopes to inspire young girls to pursue STEM subjects both in school as well as beyond that in future careers. Pretty Curious gives young girls the chance to thrive on the opportunity to experience these subjects for themselves. There are so many roles in different sectors out there that the decision can be overwhelming. It's difficult to know what you want to do at 15 let alone at 25. It's not easy to understand what STEM actually is or what it can entail for their future, having the Pretty Curious website on hand breaks down those boundaries. My school days have long passed me by but you may already know I worked in Education until late 2017 as a secondary Teaching Assistant. In that position I have definitely worked with young people engaged with STEM subjects, more so young men than women and that's why it's important that programmes like this exist. The STEM structure offers a young person a variety in their chosen career. I'm slightly bias towards creative subjects. such as the Arts but I can see why the skills in the STEM structure are important also. It's important we encourage young women especially to use their education as a peddle stall for a bright future. The Pretty Curious campaign definitely offers that opportunity. Encouraging young women to engage with the short activities could open up curiosity about the options available in the STEM structure, rather than closing them off. Future Me Avatar and Quiz. You can create a shareable and personalised avatar in a STEM-related career. This enables you to picture yourself in a potential future role ranging from a biologist to an electrical engineer. If you are unsure on what the future could hold, there's an easy personality quiz available to see what career may be best suited to your interests. Watch one of the 3 360º videos available to experience a day in the life of the architect of the Shard, see what it’s like to work on a wind farm or explore the offices of a software developer with everyday amazing women. This was a great factual experience that gave a real insight into their specific careers. There are opportunities for your parents to be involved with the new Parents quiz. This helps you to see what STEM-related career would best suit the child. You can identify their strengths, plus discover both information and guidance on pursuing a career in that specific role once you receive the results. EDF Energy is joining forces with Disney and Star Wars: The Last Jedi to inspire more girls to think about where a career in Science, Technology, Engineering and Maths could take them. I was kindly gifted a littleBits Star Wars Droid Inventor Kit which enabled me to use the skills I had to create a small robot, powered by batteries and an app I installed on my phone. It took a bit of time to get the hang of the various parts and attaching them together but the app was useful in its hints and instructions to create the droid. *paid collaboration with EDF Energy. Words are my own and photos are credit to the EDF website.